As a sweeping generalization, British UFO researchers are less single-mindedly fixated on the extraterrestrial hypothesis (and concomitant beliefs such as alien abductions and government conspiracies) than their American counterparts. Of course there are exceptions on both sides, but British ufologists do tend to adopt a “more things in Heaven and Earth” approach to the subject. This was certainly the message that came across during the first day of the BUFORA (British UFO Research Association) 50th Anniversary Conference that I attended yesterday. 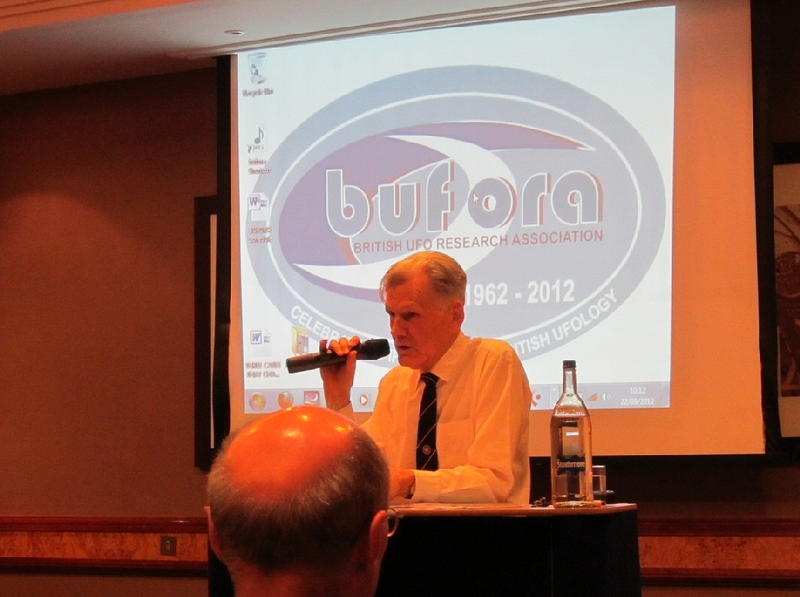 The first speaker was Lionel Beer, who (although he doesn’t look old enough) was a founder member of BUFORA back in 1962, before I had even started school. 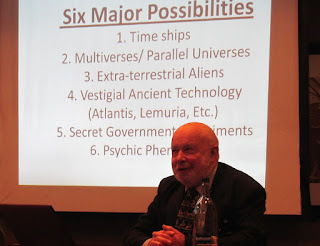 He talked mainly about the development of British ufology in the 60s and 70s, when it’s probably fair to say the focus was still on the extraterrestrial hypothesis here as in America. But I was really interested in what Lionel had to say about government involvement in the subject. He brought out a subtlety that hadn’t occurred to me before, but makes perfect sense based on what I know of that period in British history. There is no doubt that during the 1970s the police Special Branch (whose responsibility was national security and counter-insurgency) took a strong and active interest in UFO groups. That’s a well-documented fact. But it’s not the same thing as saying that they took an interest in the subject of ufology. The British authorities in the 1970s weren’t all that paranoid about an alien invasion, but they were paranoid about far-right anti-government extremists. The authorities believed that certain far-right political activists were infiltrating UFO groups in order to recruit new members. That sounds very unlikely to me, because I’ve never met a far-right UFO enthusiast in my life (although I’ve met many far-left ones)... but the fact is that it’s what the authorities believed. And it’s certainly true that if you’re looking for people with a deep-seated hatred of the establishment, a UFO group is as good a place as any to start. The second talk was by Heather Dixon, whose subject was “Developing an understanding of the Reality behind the Myths”. Essentially this was a very lucid exposition of the statement, often made by people in BUFORA, that “98 per cent of UFO cases turn out to have a perfectly rational explanation”. In some cases the explanation is physical—for example an astronomical object or atmospheric phenomenon—and in others it is physiological, for example sleep paralysis. Almost by definition, a UFO sighting is something that is novel and inexplicable to the witness, and outside their previous experience. If they have an interest in UFOs, or have been immersed in sci-fi popular culture, they may interpret what they see in ufological terms even if it is something completely different that is outside their experience, such as a rare conjunction of two astronomical objects. Many people will dismiss this sort of talk as “scepticism”, but it’s really the only way to go about serious ufological investigation. In the real world, it’s inevitable that some UFO reports will turn out to have perfectly mundane explanations. At the same time, other cases—the ones Heather calls “High Strangeness” cases—defy rational explanation. Something is going on that science can’t explain. But that still doesn’t mean it’s extraterrestrials. Many people in the Western world, seeing something they’ve never seen before, will mentally pigeonhole it as a UFO because that’s the way they’ve been brought up. You sometimes hear patronizing statements about primitive peoples along the lines “of course, if they encountered extraterrestrial aliens, they would interpret them as gods or angels or spirits”. But why not the other way around? If a sci-fi geek encountered a god/angel/spirit he or she would interpret them as a space alien! 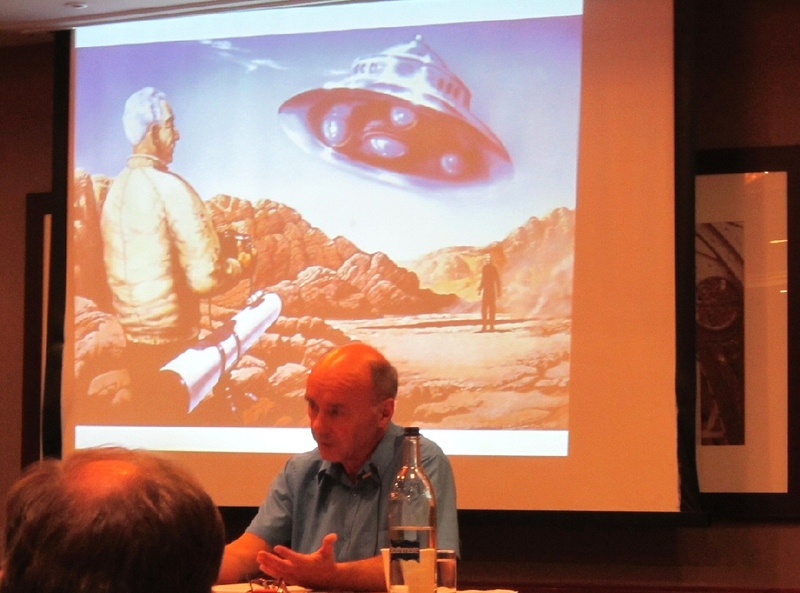 The next talk was by John Spencer, on the subject of “Political, Cultural and Social Influences of UFOs”. This was a strong contender to be the single best talk I’ve ever seen on the UFO subject... and I’ve seen a lot. Essentially it was about the “cultural tracking” aspect of the UFO phenomenon—the way UFO experiences reflect the technology, political issues and popular culture of the time in which they occur. Again, some people will dismiss this as scepticism, but it’s a real effect that has to be faced up to. This became particularly clear as John went through the history of the subject from the 1940s to the present day. In many UFO cases something undeniably extraordinary—and maybe even extraterrestrial—occurred, but the way it was described by witnesses is shaped by the concerns and obsessions of the time. An interesting point John made is that the contactees of the early 1950s—people like George Adamski—recounted long conversations with the Space Brothers, in which the latter warned the people of Earth in dire terms about the dangers of nuclear weapons. But in those days, every thinking human being on the planet was worried spitless about the threat of nuclear weapons. The Space Brothers never thought to warn the people of the 1950s about something they weren’t already obsessing about, such as ozone depletion, greenhouse gases or global warming. John’s take on the Roswell incident was also interesting. This took place in 1947, of course, but when I started reading about UFOs in the late 60s and early 70s it was never mentioned. Books of that time never bothered to mention the biggest UFO case of all time, even though it had occurred more than 20 years earlier. In order to believe in Roswell, you have to believe that the United States government is capable of lying, scheming and deception on an industrial scale. Cultural tracking wasn’t ready for that yet. So there was a long pause from 1947 to 1974, when the Watergate scandal proved beyond doubt that the United States government was indeed capable of lying, scheming and deception on an industrial scale. It was only in the post-Watergate world that people were culturally primed and ready to believe in Roswell. 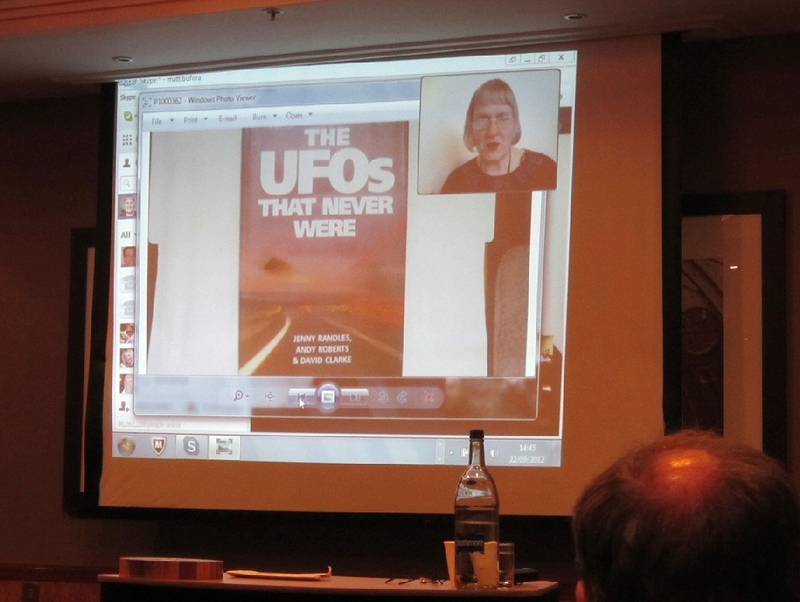 The next talk was by the legendary Jenny Randles, via a live video link from her home in North Wales. Despite her lower public profile of recent years, Jenny was as lively and entertaining a speaker as when I first saw her almost 20 years ago. 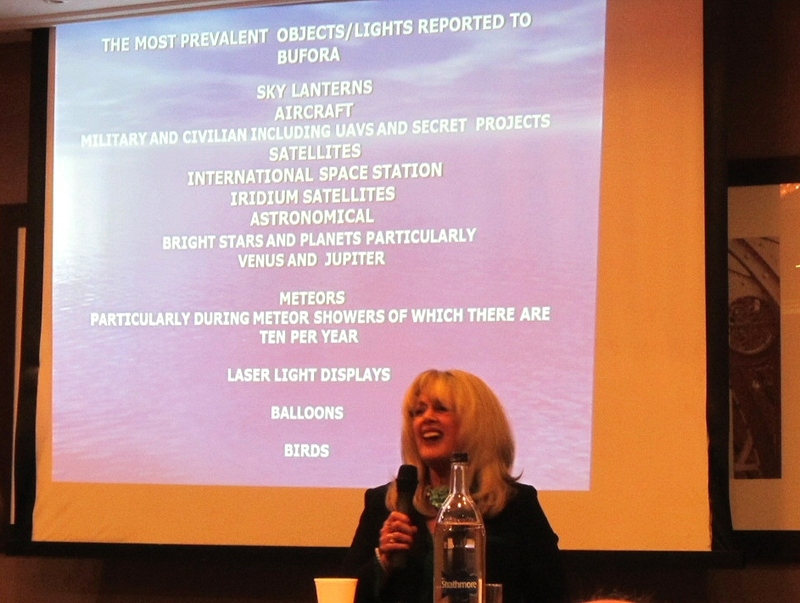 The subject of her talk was “solved” UFO cases—cases that have been definitively explained as non-extraterrestrial in origin. Who wants to hear about such things? Well I do, because I think such cases can tell you a lot about people’s perceptions and motivations, but apparently most people don’t—Jenny said her book on the subject ended up being sold for a fraction of the cover price in remainder bookshops! One striking example came from the 1960s, when a glowing orange ball was filmed hovering over an English primary school, as well as being witnessed by dozens of 10 and 11 year old children at the school. Despite having all the hallmarks of a UFO, the cameraman thought it might have something to do with the fact that a US Air Force F-111 fighter-bomber crashed nearby on the same day (in those days, the USAF was allowed to maintain a small number of air bases in the UK, as a goodwill gesture from the British government—and by inference, the British people). But when the USAF saw the photo of the orange ball hovering over the English school, their response was along the lines “Nothing to do with us. The picture was taken 14 minutes before the crash-landing of the F-111, which at no point caught fire. So it’s nothing to do with us. No, sir. If you ask us, it looks like one of them there extraterrestrial spacecraft people are always talking about.” So contrary to popular belief, this was a case of the US authorities actually encouraging an extraterrestrial interpretation of a UFO sighting. Many years later the truth emerged in a way that leaves no room for any doubt. When the F-111 first got into trouble, 14 minutes before the eventual crash-landing, the crew went through a standard procedure to reduce the risk of an explosion on landing. They ejected all the aircraft’s fuel, and used the afterburner to ignite it, causing a massive fireball. The US aircrew chose to do this immediately over an English primary school. Had it become known at the time that they had effectively placed their own safety over that of British schoolchildren, the goodwill of the British people would have evaporated... and the USAF would have been kicked out of the country. That’s the kind of cover-up and conspiracy I find easier to believe than the extraterrestrial kind. The last talk I attended was by another living legend: Lionel Fanthorpe. Lionel is now 77, although he looks ten years younger. His talk was on the subject of six alternative theories as to what UFOs (the kind that don’t have mundane explanations) might be. Only one of the six involved extraterrestrials -- the others ranged from ancient Atlantis and Lemuria to the paranormal. There’s no use pretending the talk was anything but an excuse for Lionel to hold forth about the subjects he’s always been fascinated by: timeslips, werewolves, poltergeists etc. But needless to say it was the most entertaining talk of the day, and it did reinforce what I saw as the whole theme of the conference: that there are more things in Heaven and Earth than are dreamed of by the average ETH-believer. Andrew, I had my own ufo encounter last Friday night while driving in Norfolk. It was only a ufo until Saturday morning however, when it became clear that I had seen the meteor that passed over the UK. You were lucky to see it! That particular meteor was mentioned several times yesterday as an example of how an unusual natural phenomenon can be interpreted as a UFO. Andrew, Well I was driving at the time. I saw a white light in a cloud ahead of me and assumed it was a plane descending through the cloud. As the white light came through the cloud it it has some orange lights down the side and I still thought it was a descending plane. It was not until it elongated (as bits broke off) and gave off some firework effects, that I realised it was a meteor. During the majority of 5-7 seconds (or so) of the encounter, most of the time I thought I was seeing a descending plane. So it shows how easy it is for the brain to get confused. What was most suprising was how low and big it seemed to be. It could not have been that low however, as my mother (20 miles away) also saw it. The size was very impressive! 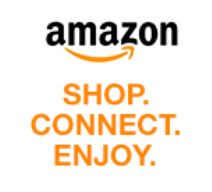 Thanks for the additional detail. That's a good example of what I quoted Heather Dixon as saying above - that if you see something that is outside your past experience, your brain immediately tries to superimpose an interpretation on it which may be completely wrong, but can have the effect of distorting your perception of events (e.g. perceiving a distant meteor as a nearby plane). Thanks for your excellent write-up. The human context fascinates me too as it mediates everything we can experience in relation to UFOs and ufology. As such, your distinction between UK and US researchers is well-noted. Where else but here can we find ufologists who don’t ‘believe’ in UFOs as anything particularly extraordinary? In the US, a ufologist would typically be in support of the ETH whereas over here the ETH is just one of several possibilities. I’ve also noticed that if a UK researcher was emphatic in their support of the ETH, they’d be ridiculed mercilessly by peers whilst in America the opposite tends to be the case. Mr Beer’s focus on Special Branch interest is something I believe a lot of researchers overlook. Taken as a group, ufologists encouraged distrust of Government, organised into groups and maintained loose networks with similarly conspiracy-focused folk overseas. They wanted to know about Rudloe Manor, Porton Down and discussed secret weapons. From a security perspective, they probably mirrored similar cells and networks used by Irish terrorists who were active in the same period. Altogether, your account of the BUFORA conference shows that ufology can be more educational as a sceptical endeavour than the woeful X-Conference format. Thanks very much for some very interesting comments. It was certainly the most rational and thoughtful day of talks on the UFO subject I think I've ever attended. It's surprising, given the common language and so much dialogue through the internet, how UK and US attitudes can still remain poles apart in some areas (This isn't meant to stereotype individuals - I'm just talking about the general culture of the two countries). I had an email from an American friend pointing out, quite rightly, that the US has plenty of right-wing UFO believers... but I stick to my guns that from a British point of view it's virtually a contradiction in terms. Will we be seeing a proceedings of this conference being published? I for one would be very much looking forward to it. And another thing, I would welcome a live stream so that those unable to attend might still be enjoying the conference. Hi Theo - I was just an audience member so can't speak for the organisers, but I believe all the talks were recorded on video. I imagine they will be released on DVD if not uploaded to the web in the not-too- distant future.